Last weekend, my daughter and I did some morning baking together. She’s thirteen and enjoys experimenting with recipes. After reading the paper and sitting outside with my husband and daughter, I told them I thought I would go inside and whip up a batch of scones. I asked them what kind of scones they thought I should bake and Colleen came up with this delicious combination. Scones are probably the easiest of breakfast pastries to throw together. They’re just about as easy to make as biscuits but they taste much better. Scones have a subtle sweetness and crumbly, buttery texture and are ideal for lazy mornings where relaxation is on the menu. We made these scones together in the kitchen. Rather, Colleen made them. I just told her what ingredients to add to the bowl. Simple ingredients for simple and delicious scones. I loved the combination Colleen picked – white chocolate and macadamia nuts. They go so well together. The creamy white chocolate alongside the crunchy buttery macadamia nuts. Heavenly! We topped these scones with a simple powdered sugar glaze and crushed white chocolate chips because as Colleen convinced me that we could never have too many white chocolate chips in a scone. She was right. Colleen and I bake together often. Baking with my daughter has become a special time for me. I no longer try to monopolize the baking process because I can perhaps do it quicker or with less mess. I’m slowing down and using our baking times together to create special memories for both of us, because time flies way too quickly and I want to savor every minute. Buttery and delicate White Chocolate Macadamia Nut Scones topped with a light almond glaze. Stir in the chopped macadamia nuts and white chocolate chips. In a small bowl, whisk together the powdered sugar, cream and almond extract until smooth. The glaze should have enough liquid in it to drizzle onto the scones so add a little more cream if necessary. Top with crushed white chocolate chips. These sound amazing! I may just have to buy some macadamia nuts the next time I’m at Costco. My whole family loves macadamia nuts but they’re generally a splurge b/c of the price. Can’t wait to try these out! Those looks great! I don’t think I’ve ever made scones. Love your family photos! These look delicious! I can’t wait to try out the recipe! Yum, these scones look fantastic. Luckily, I have some mac nuts on hand, will have to try your recipe this weekend. 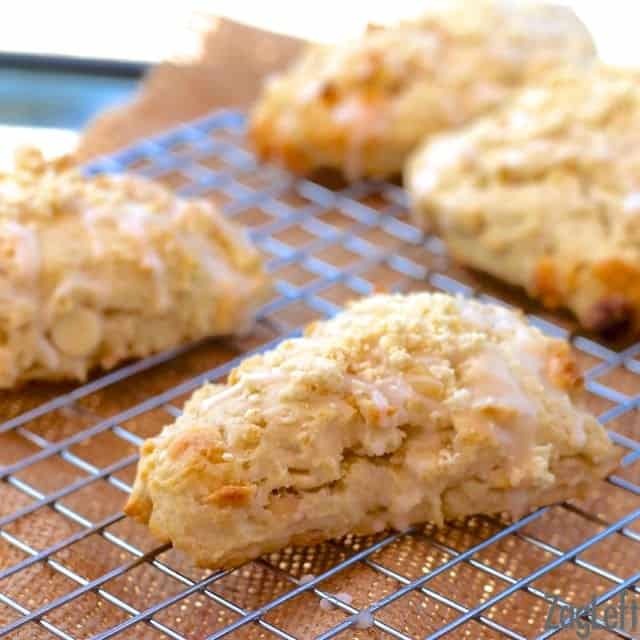 The scones look great – they are one of my favorite breakfast treats! I love cooking with my daughter as well. Over the years it has been an incredible time of bonding for us. All of my children are out and grown. I love the relationship that we have now. They text asking for recipes and photos of themselves in clothes, while they’re still in the dressing rooms. I love that they value my opinion, still. The perfect breakfast or anytime treat – these scones look delicious! I love this post. And I love that you are your daughter are baking together–I bet she loves have you to herself after all those years of sharing lol. I almost feel guilty pinning these on my breakfast board, but let’s face it, desserts for breakfast are the best! These look like my kind of breakfast treat! Thank you so much, Lisa. I really appreciate your kind words. I love that your daughter came up with this combo! It makes me think of my mos favorite cookie – the Sausalito. But so much better because it is a scone (and I cannot resist those). Thank you so much, Faith. I love that my daughter still likes to hang out with me. I know now that she’s a teenager, that might change – hopefully not, though. Thanks for reading. Enjoy your weekend. wow, these look insanely amazing! We love scones at our house and I fully intend on trying these guys out asap!!! These look wonderful. White chocolate and macadamia nuts are such a classic pairing. I’s great that you bake with your daughter. My daughter took no interest in cooking. My granddaughter is making up for it though. She LOVES to bake and we spend a lot of time in the kitchen together. So much fun. How nice that you and your granddaughter enjoy spending time in the kitchen. What wonderful memories you are making. Out of my five children, only my youngest daughter and my second oldest son enjoyed cooking with me and for my son who is living on his own, knowing how to cook has been wonderful. He surprises me with some of his kitchen creations.